SecuraKey manufactures a variety of access control cards. Some of these cards are proprietary to OEM customers. Others are special technology cards and key tags produced to exact specifications. The following information relates only to the most popular access control cards, sold under the Secura Key brand. These are available in a variety of programming and format options. 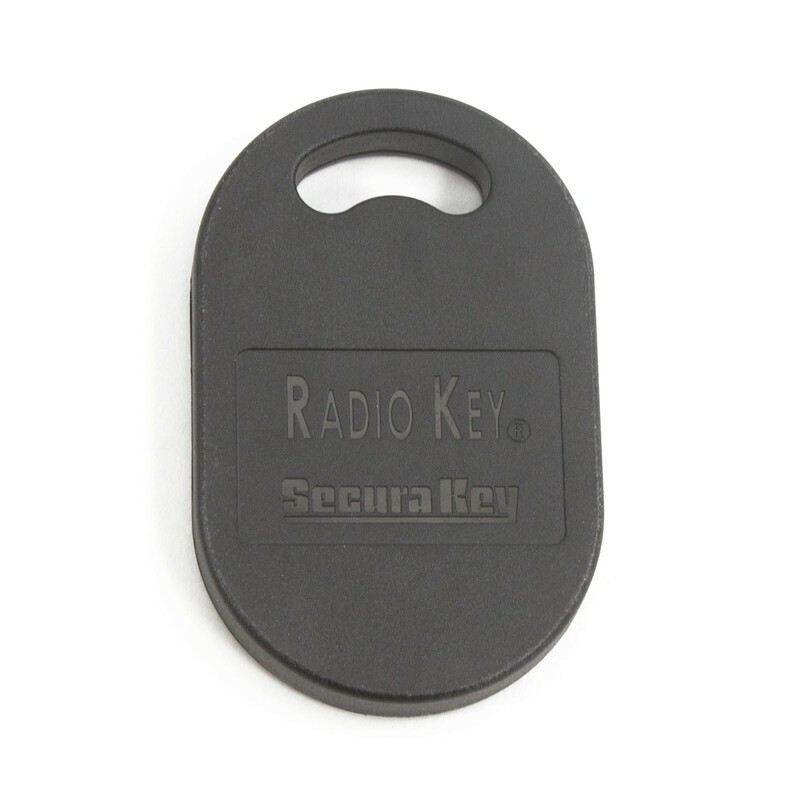 Radio Key® proximity cards are now available in specifc HID-formats: 26,34 and 37 bit. To indicate that this option has been selected, we have added an H suffix to the base part number in order to differentiate these cards from regular Radio Key card orders. (RKCM H, RKCI H, RKKT H). The 3-digit format number must still be provided with the order. These cards are designed to work with most dye-sublimation plastic card printers on the market. We stock these cards with no printing, white/glossy on both sides. They also have the facility code, card ID numbers and the Sales Order number laser-engraved on the front. 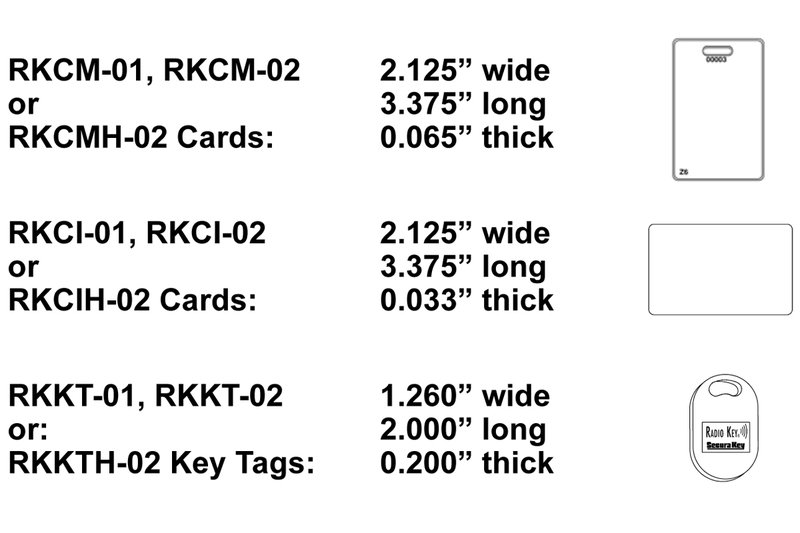 Read “Information on Dye-Sublimation Printing of Secura Key Cards” below. These adhesive-backed labels are CR80 card sized and may be printed in most dye-sublimation plastic card printers. The paper backing can then be removed from the label, which is then applied to the RKCM-01/02 cards. Read “Information on Dye-Sublimation Printing of Secura Key Cards” on page 11. The part number is for a pack of 100 labels. The Sales Order (SO) Number is now laser-engraved on encoded Secura Key Cards, except for OEM cards. The SO number allows Secura Key customer service to refer end-user customers to their dealer for card re-orders, and it can help determine the format, encoding and other ordering information associated with the cards. Use this when connecting Secura Key readers to control panels by others. Format 201 is also stocked by some distributors for quick delivery. Many end users will share each facility code. Card numbers range up to 65,635. 255 facility codes are available. Recommended when using Secura Key readers with SK-ACPE. Card numbers range up to 65,635. Format 303 allows over 16,000 different facility codes. Each job can be issued a unique blind facility code. Blind codes are used to look up the true encoded Facility Code at the factory. 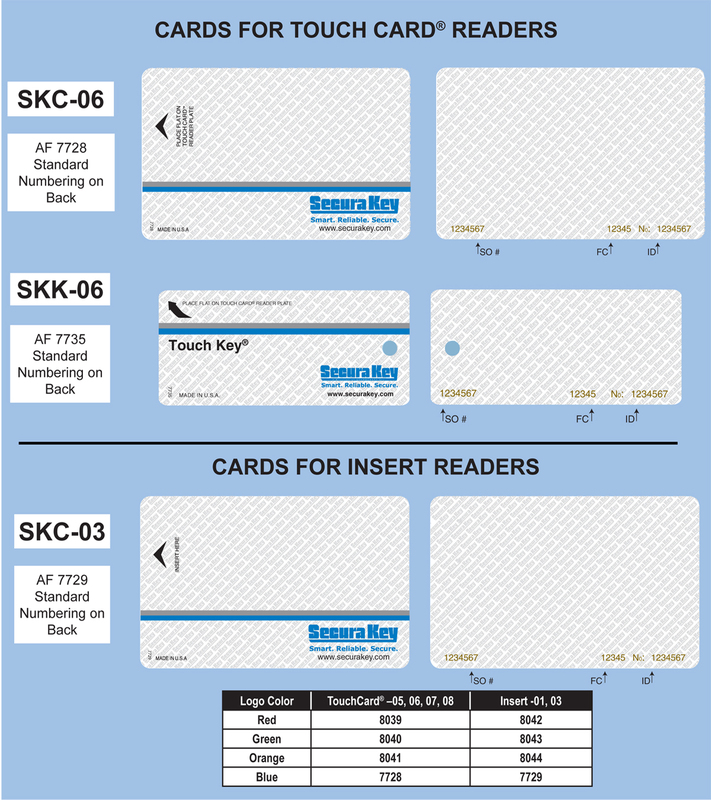 Unless otherwise specified, all RKCI cards will be blank (white) on both sides with a glossy finish.They can also be ordered with Secura Key standard artwork printed on both sides (AF 7724). Custom artwork can also be provided, at an additional charge. Unless otherwise specified, the sales order number, facility code, and card number will be printed on the front of the card. Laser Engraved Numbering is standard. 37-bit with Facility Code, (HID Format H10304) Card numbers are available up to 500,000 and facility codes up to 65000 are available. Many panels cannot handle ID numbers or facility codes this long. Secura Key does not guarantee unique numbering. 37-bit without Facility Code, (HID Format H10302). ID numbers are available up to 6 billion - Most panels cannot handle a card ID number this long. Secura Key does not guarantee unique numbering. If you are ordering cards for a NEW project,and do not need to match an existing facility code, for Format 201 cards, say “NEW FACILITY CODE” and we will furnish cards from stock (sequentially numbered, all with the same facility code). For Format 303 cards state “NEW FACILITY CODE” for a new installation and we will create a new blind code and encode the cards to order. New Format 303 projects usually begin with Card ID Number 1. Our most popular barium ferrite cards are those used with the 26SA and the 28SA-PLUS access control units. These cards are factory-encoded with a facility (site) code and a unique card ID number. When re-ordering these cards it is necessary to specify the existing facility code and to provide the starting card number ( generally one number higher than the highest existing card). Unless otherwise specified, SKC-06 cards will be printed with a blue Secura Key logo, Art File 7728, and SKC-03 cards will be printed with Art File 7729. Standard printing options are available at no extra charge. Additional Art Files with the standard Secura Key logo artwork are also available. Red, Green, Orange and Blue logos are available to help visually identify different groups of card holders. There will be no custom printing or setup charges for these artfiles, but the MOQ is 250 cards, Lead time is 3 weeks. Unless otherwise specified, the Sales Order number, facility code and card number will be printed on bottom edge of the back of the card. Laser Engraved Numbering is standard. 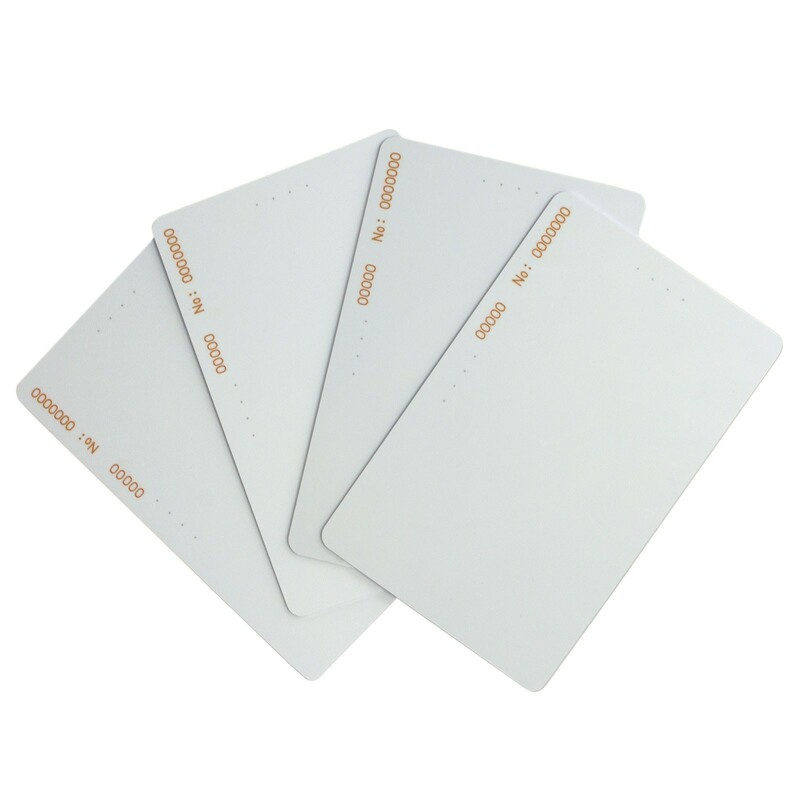 Dual Bond Cards: SKC-06 cards have a clear plastic overlay flap with a strong adhesive for making self-laminated ID cards. Peel away the backing sheet and attach the photo or other document to the face of the card. Press down the clear flap and you have a permanent ID card. Direct Image: Order SKC-06 cards with Art File 7728 or SKC-03 cards with Art File 7729. This preprinting is limited to the top-front face of the card and leaves ample space for a photo, etc. Standard card thickness is 0.044”, so be sure your card printer can accept this thickness before ordering cards. Laser engraved numbering is included. Read “Information on Dye-Sublimation Printing of Secura Key Cards” below. The SKL-03P insert reader uses SKC-03 cards. These cards have a facility code that is common to all of the cards. The cards do NOT have individual ID numbers, but may be ordered with sequential numbering to aid the customer in card accounting. All ID and artwork options available with the SKC-06 cards are also available with SKC-03 cards. All cards, tags and labels can be ordered encoded with either 26 or 32-bit Wiegand data format. You must specify the bit format together with the Facility Code and ID Range, when ordering. (Card format is no longer part of the card model number). On e*Tag® credentials, the letter “E” always appears as the first character of the facility code (i.e. EA6 for 26-bit, or E12345 for 32-bit). Magnetic strips, multi-technology, signature panels, etc. 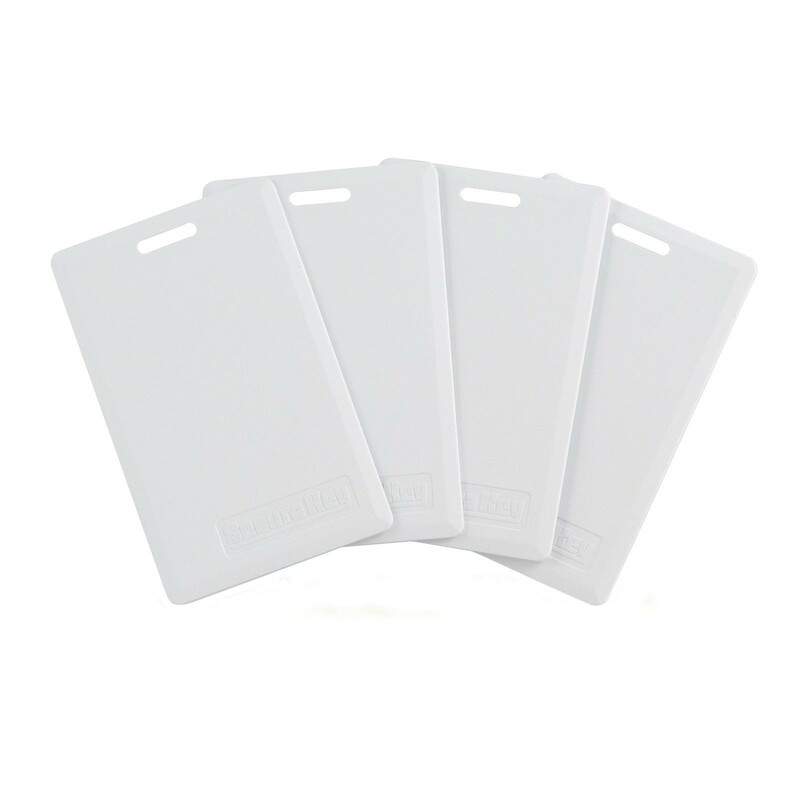 Secura Key is one of the few remaining sources for Wiegand Swipe Cards. 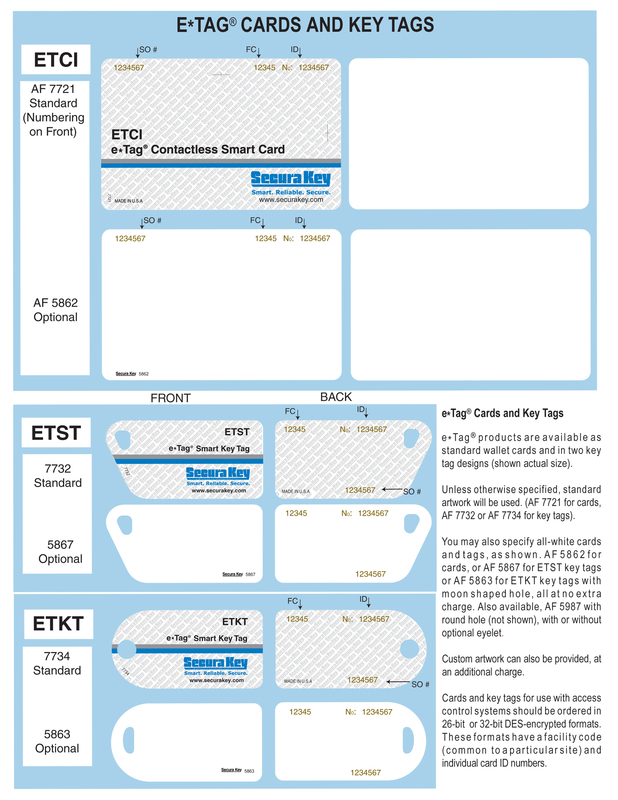 These cards work with Wiegand Swipe readers manufactured by HID and Sensor Engineering. Secura Key offers Wiegand Cards in formats up to 40 bits. To order 26-bit cards, just provide the facility code and the number range; for other formats contact the factory, as one or more sample cards may be required. Secura Key does not provide “zero-gap” Wiegand cards. If cards within the requested number range fail to pass quality testing, additional cards immediately above the range will be provided to complete the order. 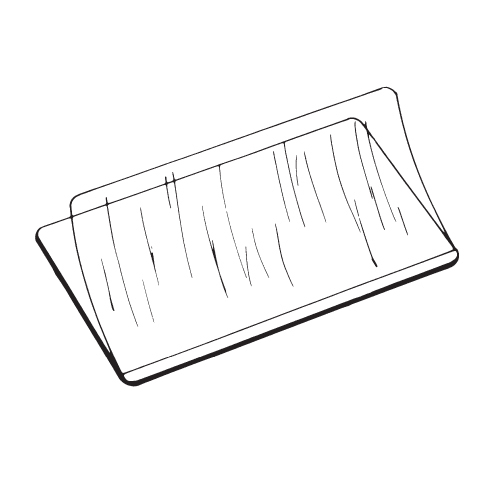 Wiegand modules are manufactured prior to lamination and die cutting of the cards, and 15 cards are laminated in a single sheet, so it is not practical to replace an individual card that fails. Wiegand cards are not returnable, because every order is custom manufactured, so be certain about encoding and printing information prior to placing the order. Wiegand Cards are available with many different options and these are specified in the part number and encoding information that you include in the order. Please review the Wiegand Card Ordering Guide and call the factory if you have any questions. Secura Key also manufactures Cardkey compatible Wiegand cards sold exclusively through Johnson Controls. For more information on Secura Key products click here!